News item one: Guy holds world record largest collection of Hello Kitty memorabilia. Masao Gunji has 5,169 Hello Kitty items lining the walls, tables and floors of the residence. As a fellow male fan, I salute you. This includes The Sonic X Hello Kitty with Chococat as Miles “Tails” Prower and a plush of Gudetama which translated as Lazy egg, he is an anthropomorphized egg know for his lethargic personality. 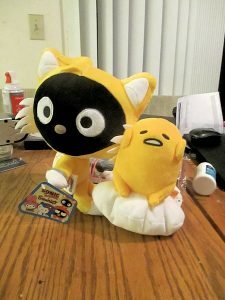 This entry was posted in Blog News, Collections, Male Fans, Sanrio and tagged Chococat, Gudetama, Worlds Record by Actonrf. Bookmark the permalink.